A BJP Yuva Morcha leader has said that a Waghmore (Gauri's alleged shooter) would be born in every house to protect Hinduism. A few days ago, a photograph of Parashuram Waghmore, the man suspected to have shot Gauri Lankesh, and Sri Rama Sene chief Pramod Muthalik had gone viral. At the time, Muthalik had categorically denied knowing Prashuram Waghmore. Now, the Sri Rama Sene’s Facebook page, has started a fundraising campaign for Waghmore’s family. “Can you not share a portion of your earnings, a morsel of your food with patriots? Parashuram Waghmore’s family is in a financial crunch. Please help them by donating money,” the post says. 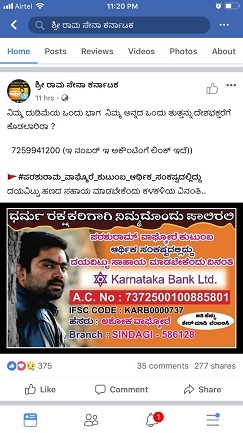 The post comes with a photograph of Parashuram Waghmore along with an account number to which people have been requested to donate money. 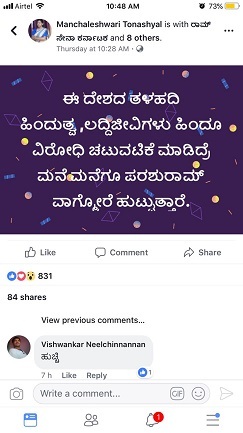 Manchaleshwari Tonashyal, the Women’s Wing Chief of the Sene and a member of the BJP’s Yuva Morcha has also put up an alarming post on Facebook. "There will be a Parashuram Waghmore born in every house if anti-Hindu activities continue to be carried out by elements who are trying to sabotage the foundation of Hindutva in this country,” her Facebook post reads. Speaking to TNM, Pramod Muthalik, said that Manchaleshwari was not a part of the Sri Rama Sene any longer and was now working for the BJP. Asked what would happen if the police slapped cases against him for provoking youngsters to take up aggressive Hindutva, Muthalik said he is ready to face any such case, while adding he is not “directly linked to this case". Meanwhile, the SIT probing the case has allegedly procured a confession from Waghmore. Sources in the SIT say that the Waghmore had allegedly gone to kill Gauri Lankesh a few days prior to September 5 but could not carry out the task as the journalist was already inside her house. “Gauri Lankesh was killed on September 5 but Parashuram Waghmore was picked up by an unidentified man and dropped off near Gauri’s house a few days before September 5. This was supposed to be the day he was assigned to shoot at Gauri but the plan was unsuccessful. On the night of September 5, however, a different man is said to have picked up Waghmore from his home and given him the weapon. Waghmore, up on reaching her residence called out to her. When she looked back, he took the shot,” the source added. Now, the SIT is looking for three more suspects including Nihal alias Dada, who was one of the men who handed over the weapon to Waghmore.